Henry Ford used hemp-and-sisal cellulose plastic to build car doors and fenders in 1941. On video Henry Ford demonstrated that his hemp cars were more resistant to blows from a sledgehammer than steel-bodied cars were. Clearly hemp plastic and composites are not a new technology but with todays science and know how the future of hemp plastic has never looked more promising. 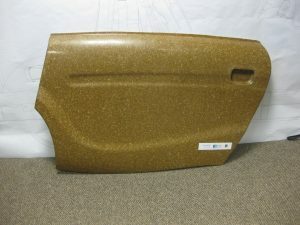 These hemp composites and hemp plastic are less expensive than dangerous fiberglass counterparts. Hemp fiberglass replacements would only cost 50 to 70 cents a pound. These hemp composites could replace carbon and glass fibers, which have environmental and weight problems, and run from 60 cents to 5 dollars a pound. The reason why virtually all European car makers are switching to hemp based door panels, columns, seat backs, boot linings, floor consoles, instrument panels, and other external components is because the organic hemp based products are lighter, safer in accidents, recyclable, and more durable. Do we know the percentage of hemp plastic made and or used today? Would hemp plastic be cost effective for businesses to use? It’s a question for a paper I’m writing. We should be working on making a hemp plastic building material that won’t biodegrade and fire proof, then we can start building structures that will stand through time. Through preengineerimg building material we could incorporate many different types of structural and technological factors right into the material. There is a ton we can do that we dont even know about yet…I’ve got more than a few ideas is like to try out someday, if I had the resources. I’m just glad to see the world has open up their eyes to new possibilities. If you have heard of the great pacific garbage patch, plastics derived from hemp seem a reasonable solution. I am in collage and I am interested in starting a company that makes hemp based products, is there anyone I could discus the legality of doing this in america with? Or just discuss hemp in general. Great stuff. Who is the largest manufacturer of hemp plastics or industrial composites out there?? Best Practices Packaging makes hemp plastic, 100 metric tons per batch. I believe that places this company as the single largest commercial supplier of hemp plastic in the world. Is it legal to import raw hemp plastic pellets for injection molding into the USA? No, they cannot grow and thus are allowed by the Federal Government. Love you all—Go! Go! Go! Just had a quick question… How quickly does hemp plastic biodegrade??? At Best Practices, we can schedule the decomposition to the needs of the plastic. 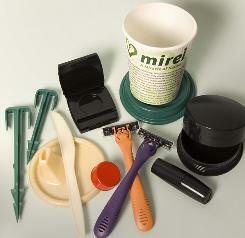 For example, food containers can start to degrade in 90 days, while we might time other plastics to years or decades. I have built a grand lodge out of hemp crete ten years ago and I am hardly a newcomer to this subject, but after all these years of having the awareness of the potential for all the uses of hemp I still see it is very difficult to ferret out hands on instructions for producing such things as hemp plastics and or expandable hemp based sprayfoam for example. Anything to offer here and why such things that I know perfectly well exist are so difficult to pin down.It seems to me that in the same way that you would make UFFI foam you could replace the urethane pellets and the urea formaldeyhyde solvent to come up with something for hemp spray foam technique? Hi Mark! I agree with you on the lack of information on hemp and hemp based products. I am looking for a manufacturer of hemp plastic pellets and found one in Autralia. I can find no others. It was my wish to produce a specific product from hemp plastic and it may prove difficult. The technology is there but in the U.S. or many other countries it seems hard to get your hands on it. http://blogs.sjsu.edu/today/2011/hemp-plastic-water-bottles-steals-the-show-at-innovation-challenge/ check this link. The public is very interested. just curious about your build, is it a snowy cold location? how is the outside finnished?